If you are “camper” you will already know what we are talking about. And if you still are not, here’s a little trick for your next getaway. Imagine that you are going camping, already packed “all your stuff”, packed your whole family, and then you load everything and everyone in the car and depart. In your every year favourite campsite, you set up your tent trailer, organize the beds, organize the family, bikes, backpacks, etc. And then you think: it would be great to have a folding table and chairs, which could be put in front of the tent. Where would sit comfortably to eat, to talk with friends and to spend a relaxing time. But, although you came to this same conclusion last year, you knew that this year you couldn’t bring it because you simply do not have more space! You have the trailer hitched to the car, the entire boot full with the most important for camping days. We have also gone through this and here is our solution – Storage covers for camping trailers. What is a Comanche storage cover? 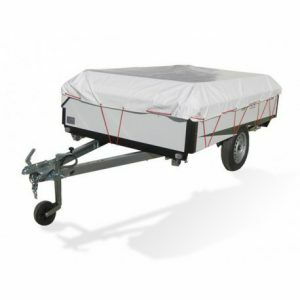 The storage cover for camping trailers is a white canvas, made of high resistance PVC, Comanche brand. It has built-in rubber elastic bands so you can load more volume compared to any other normal tarpaulin on the market. You can store it easily in your trailer, because it’s flexible, very strong, and weigh 2 kg. In addition, being PVC, it is easy to clean with a wet rag. How does the Comanche storage cover work? Imagine that apart from the tent, clothes, food, bikes and everything else you might need, you also want to bring the chairs, the table and the camping furniture. Everything that does not fit in the car is placed on the roof of the Comanche trailer. You make sure all is properly fixed and you cover it with the storage cover. Now you tie it with the red elastic bands that come with the cover. All the trailers of Comanche, in the inferior part, have installed the hooks that serve exactly for this purpose. You tighten the ropes well and that’s it! You will protect all the additional luggage of rain, dust or wind. You save time because you don’t have to play “TETRIS” in your car. 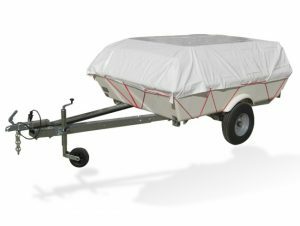 How to know which storage covers fits with your trailer? In Comanche online shop we have available covers for all models of current camping trailers. To make it easy, they have the same name as your tent trailer, so there will be no confusion. If you cannot find your model, contact us, we sure have a solution for you. You see, with the Comanche storage covers you will protect the accessories that you carry on your trailer. They will not be seen, they will not be damaged and, most importantly, you will be able to carry everything you need to relax during your holidays. Take with you everything that makes you feel happy during the holidays. Take the comfort of your home to the campsite! For us, the camping trailers owners, is something to love. Every year bring us a holiday in nature, but with the comfort and security that we can feel at home. Our camping trailer gives us the freedom to start a trip at any moment, and get the best accommodation, that we only can feel at home. But, what to do with him, when holidays are over, and we cannot travel as we would like? Normally they rest parked at home, in the garage or somewhere, waiting for the next trip. And, for sure, every time you see your trailer parked, are you thinking about the wasted place there. To help you, and the rest of campers, COMANCHE recommends a simple and clever system, the storage brackets. How does the storage bracket for trailers work? The storage bracket it’s a system designed to place your camping trailer on the side, saving a place in your parking. Even for long periods of storage, you can ever remove the wheels of your trailer or the towing bar, and save more place. As an option, you can also include in your storage bracket a kit of wheels to move them easier. Once the trailer is on the sides, just push them to place it where you want. How do we fix the storage bracket to the trailer? The COMANCHE camping trailers are ready to be used with the storage bracket. They have a special fixation on the chassis to fix the” T” legs. In case you cannot see these fixing points, don’t worry, just ask us and we will send you the fixing points with your storage bracket. As well you have checked the fixing points, now we are ready to install the parking supports. The storage bracket are conformed by 2 “T” legs, in dip galvanized steel, ready to easily put and fix into the fixing points. 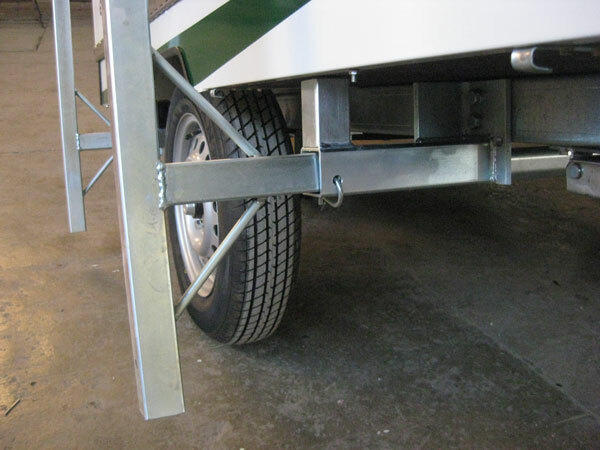 Each leg is designed to enter inside the fixing point and ready to assure with a “R” .Now be sure to get enough place to move the trailer and operate comfort around them. Check the trailer is empty of extra weight and accessories to be lighter to move the trailer. Don’t do it alone, it’s just better to do it with one or two people more, according to the size of the trailer. Distribute the people at the length of the trailer, and start to lift up the trailer side. At these point you will see the wheel on the air, it’s the strength moment, until the legs of the storage bracket will contact the floor. From now, it’s just to lift the trailer to put it over the legs completely. And that’s all! If you want, you can remove the wheels and, in case to want more place, put out the tow bar to get more place. Which storage bracket is suitable for your trailer? Every COMANCHE camping trailer has his own support; think each trailer has different sizes and weights. In our website you can find your model, so each storage bracket is named as his trailer tent. If you cannot find yours, please contact us by mail or calling and we will help you to get yours. 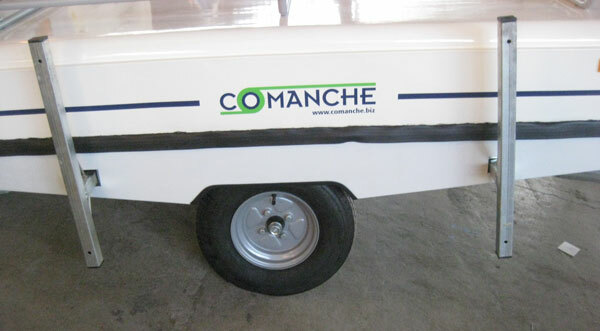 In case your trailer is not a COMANCHE, contact the manufacturer to find the solution. Think on it the next time you are rearranging your garage, and save space with this clever and simple solution.